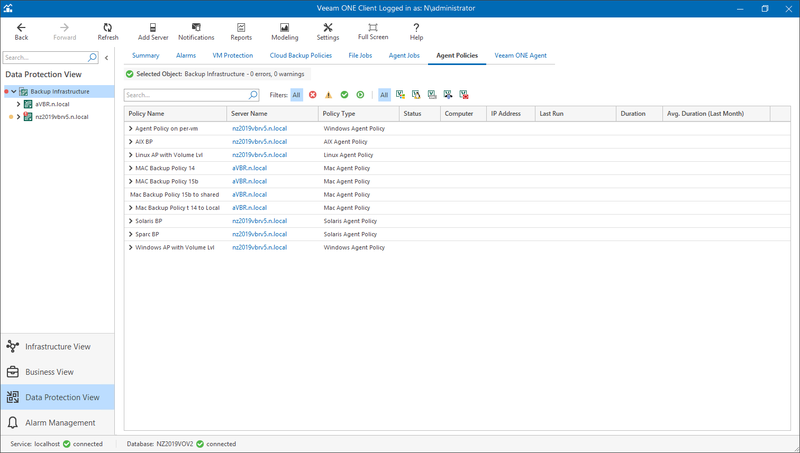 Veeam ONE Monitor allows you to track Veeam Backup Agent for Windows and Veeam Backup Agent for Linux backup policies that configure Veeam Backup Agent for Windows and Veeam Backup Agent for Linux job settings on remote computers, and that are managed by Veeam Backup & Replication servers connected to Veeam ONE. For details, see Accessing Veeam ONE Monitor..
At the bottom of the inventory pane, click Data Protection View. In the inventory pane, select the necessary backup infrastructure node. Open the Agent Policies tab. To show or hide backup policies with a specific status, use the status buttons at the top of the list (Show all policies, Show failed policies, Show policies with warnings, Show successful policies, Show running policies). To show or hide backup policies by type, use the job type buttons at the top of the list (Show Windows policies, Show Linux policies, All). To find backup policies by name, use the search field at the top right corner. The list of backup policies shows all Veeam Backup Agent for Windows and Veeam Backup Agent for Linux backup policies for the backup infrastructure level that you selected in the inventory pane. The “No info” label indicates that no information is available for the backup policy because data has not been collected yet.